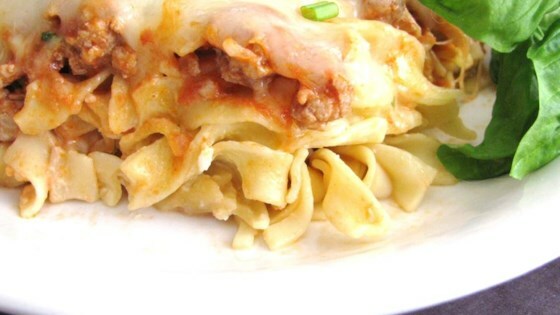 "A satisfying casserole using ground turkey, egg noodles, and plenty of cheese." A noodle casserole with a creamy special ingredient! My daughter made this for dinner this evening. Easy enough for her to make... and all the kids are giving it 5 stars! This one is a keeper! She made it exactly as written. Was very family friendly and delicious! Even my toddler loved it! I think next time I may use the philadelphia cooking cream in place of the milk, cream cheese, and garlic!